CatTime salutes Kitty City Kansas Rescue. Our founders had been voluneering with traditional shelters for years! They saw a need fora rescue that would helpthe very small and ill who had been taken to traditional shelters.So much of donated money goes to paychecks instead of the animals. Although this is necessary, they wished be build a true all-volunteer groupso they could help more animals. Kitty City Kansas Rescue relies heavily on donations. Medicalbills average $6,000 per month! 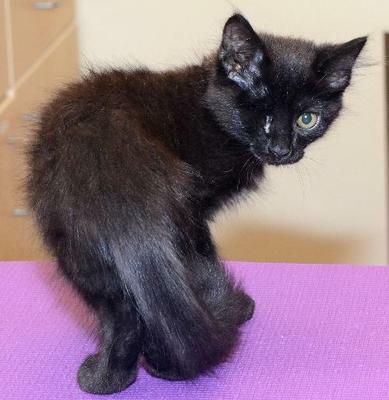 Black kitten, Daytona, arrived with an infected eye which had to be removed. We are a small group of unpaid volunteers dedicated to saving homeless kittens and cats from euthanasia in kill shelters and to adopting them into approved, permanent, loving homes. We are a no-kill rescue. Our kitties live cage free in licensed foster homes in the metro area until they are adopted. We specialize in rescuing very young, and often ill, kittens and bottle feeding them while nursing them back to health. Most come from high kill shelters. We have built strong affiliations with several shelters thatcontact us about new arrivals. We have built a network of an average of 20 foster homes at any given time. We average about 100 – 150 cats and kittensin our care at any given time. White kitten, Popcorn, rescued from a high-volume shelter. Trio was found with her left back leg severed at the hock. Even when she came into the vet clinic she was purring and very friendly. Her leg was amputated and has healed extremely well. Please don’t think though that she is a cat who will not jump on countertops or furniture — she is purrfectly capable!!! She LOVES sitting on your lap but don’t try knitting when she is there! She is good with cats but HATES dogs. 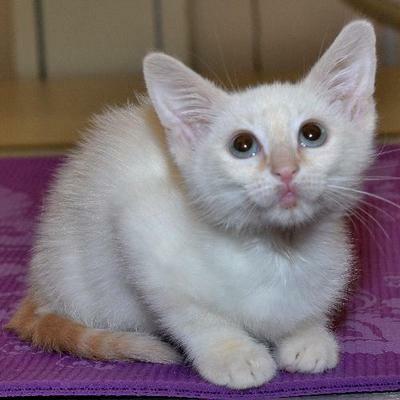 Want to support Kitty City Kansas Rescue? Make a donation to this worthy organization here.